South African women are tired of the violence and abuse that they are suffering at the hands of men, and have given the president until August 9, Women’s Day, to respond to a list of 24 demands. In cities and towns across southern Africa, thousands of women marched on Wednesday, August 1, under the banner of #TotalShutdown to demand an end to gender-based violence. The call was for women and gender nonconforming individuals to cease economic activity for the day and to take to the streets to call on the government to declare gender-based violence a national crisis. The call was answered by thousands of people across 17 South African cities and towns as well as Maseru, the Lesotho capital and Windhoek in Namibia. 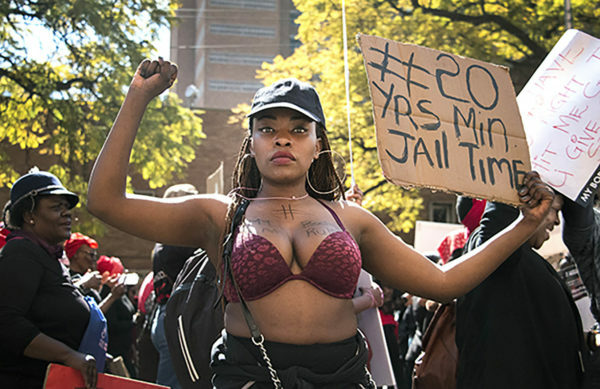 The marchers were wearing t-shirts and carrying placards with names, ages and crimes committed against survivors that made their demands clear: “My body – not your crime scene”; “He beat her 132 times. He gave her flowers once”; “Women are human not rocks. If you strike me, I will bleed”. Protestors in Pretoria marched to the Union Buildings to hand over a memorandum of demands to President Cyril Ramaphosa. The demands included the establishment of specialised courts to deal with gender-based violence and more effective training of police and law enforcement officers in dealing with gender-based violence cases. National students co-ordinator of #TotalShutdown, Yolanda Dyantyi, told Wits Vuvuzela that, “There are 24 national demands which symbolise each year that the ANC has failed to respond to the issue of gender-based violence since 1994. She told Wits Vuvuzela that, “I’m going because I feel like there are so many women who unfortunately could not make it and I’m standing in for them. At five minutes to 13:00 the organisers called on the crowd gathered in central Pretoria to cease all singing, asking for a five-minute moment of silence to allow those present to reflect on their own experiences and the experiences of those they had lost to gender-based violence. The protesters clashed with police officers, after attempting to break through the barriers to get to President Cyril Ramaphosa’s office. When Higher Education Minister Naledi Pandor came to receive the memorandum in Ramaphosa’s place, protestors booed her and refused to leave the grounds until the president came to meet them. Ramaphosa eventually came out around 21:00 and accepted the memorandum of demands. The president released a statement on Twitter commending the bravery of those who protested. “I feel proud knowing that we have women like you. “Equally, I’m ashamed that we treat you in the way that we do. It must stop. Gender-based violence must disappear. “We will walk this journey with you until all the demands you have made are addressed,” Ramaphosa said. Wits Vuvuzela, Gender-based harm on the increase around Wits, April 20.